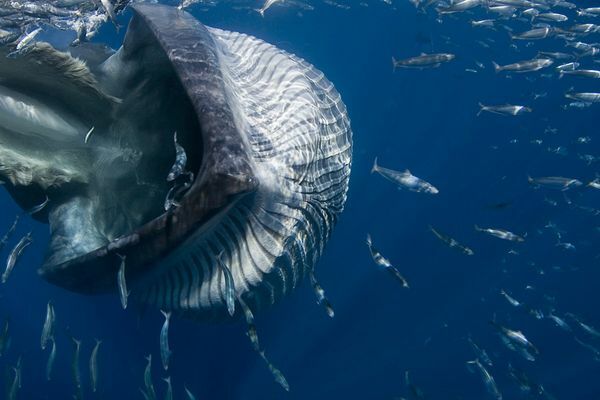 Fish flee the gaping maw of a Bryde’s whale, which surprised…(the photographer, who said) he snapped the picture while also fleeing the whale. 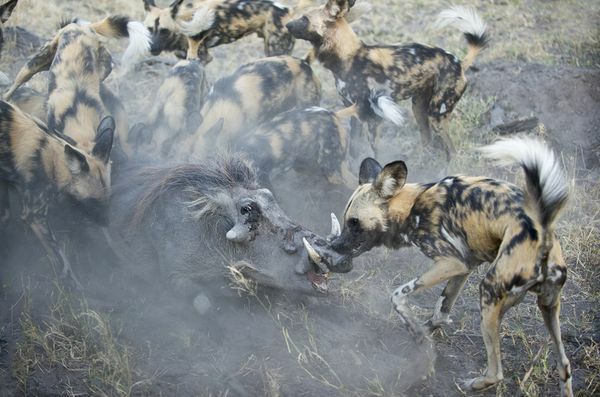 A pack of African wild dogs attacks a warthog in northern Botswana. They live in packs that are usually dominated by a monogamous breeding pair. The female has a litter of 2 to 20 pups, which are cared for by the entire pack. These dogs are very social, and packs have been known to share food and to assist weak or ill members. Social interactions are common, and the dogs communicate by touch, actions, and vocalizations. African wild dogs hunt in formidable, cooperative packs of 6 to 20 (or more) animals. Larger packs were more common before the dogs became endangered. Packs hunt antelopes and will also tackle much larger prey, such as wildebeests, particularly if their quarry is ill or injured. The dogs supplement their diet with rodents and birds. African hunting dogs are endangered. Check out all the photos, including the winner (of homeless children in a scrap yard): Best Environmental Photos of 2011. Then if you’re really interested here are the 2010 photos.